Just not here. Somewhere though, it is spring – full of birdsong and pleasantly crisp air. Here in northern Michigan, we will have to content ourselves with a bit more winter. Since the sun is spending increasing amounts of her time with us, it no longer feels so dreary, and so even though it was only in the twenties today, this weekend somehow managed to feel like spring. We started the weekend off on the right foot by leaving the house promptly at 5:00pm on Friday and heading for Shanty Creek. We hadn’t been skiing since we went with our nephews on Saturday, partly because I was catching up at work, and partly because it had warmed a bit and then cooled again, which usually creates icy slopes. Not fun. But Friday, conditions seemed to have improved, and we skied three glorious hours before heading to the local pub for dinner. (I feel like I would be remiss here if I didn’t mention that the snow was fun, and Jim joined us for two hours, which were definitely some of the best skiing I’ve seen him do – kudos to you Jim! 🙂 ) Saturday morning, we were up bright and early (for us!) and were back out skiing again before 9:00am on pristine groomed hills. A little after 11:00, word had gotten out about what a great skiing day it was, so we left. We are such ridiculously spoiled hermits – as soon as we begin to have to wait in lines at the lift, we leave. Sometimes Tony and I behave like grown-ups. Sometimes we do not. Friday evening and Saturday morning – normal adult behavior. Saturday evening? We had a slumber party at Jim and Jess’s, where we stayed up too late eating popcorn and watching a scary movie. Or “scary” movie. Or just “not good.” We all agreed – Paranormal Activity 4 was a huge disappointment, and we didn’t have super-high expectations. Ah well – liking three of them was more than I had really hoped for anyway. We first stopped in Empire, but there were about six other people out taking pictures, and you already know what kind of misanthrope I am. We enjoyed the view from the car and left those (charming, I am sure) folks to continue their photography field trip uninterrupted. Taking our cue from Jim and Jess’s Saturday excursion there, we headed to the Esch Road Beach. The Empire Bluffs loom large to the north, and Otter Creek spills into Lake Michigan to the south. We wandered along the ice shelf for a bit, as always, awed by the quickly-made ice/sand structures that mimic geologic formations. I then hopped into the creek, convinced of the water-repellent properties of my boots, while Tony stayed on dry snowy land, apparently not convinced that his ankle-high shoes were up to the task. 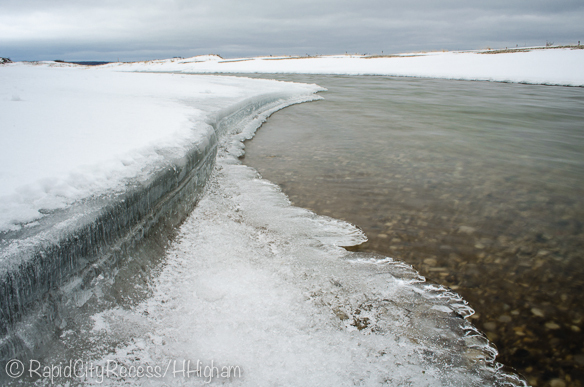 After basking in the gentle trickle of the creek for exactly the right amount of time – which happens to be measured in units of frozen legs – we hiked back to the car and drove a few more miles south to Platte Point. Since he still wasn’t aptly dressed for the lakeshore, I left Tony in the car while I went exploring. One of my favorite things about this area is that you feel like you’re at the end of the dunes. They guard the Platte River as it wends its way toward the Big Lake, and then the beach is wide open. Also, in the summer, it’s a great place to float in a life jacket/inner tube because the water is fairly deep and quite swift. All right, so obviously it’s not spring here. But, the sun is shining and the grass is green (under the three feet of snow, I mean), and for me that’s enough. As Carol would say, I wish you enough too! 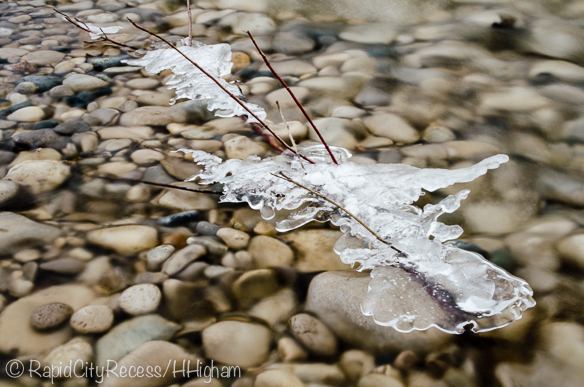 This entry was posted in Nature, Photography, Visits and tagged Esch Beach, friends, ice, icicles, Lake Michigan, Michigan, nature photography, Otter Creek, photography, photos, Platte Point, Platte River, scary movies, Shanty Creek, skiing, spring, winter, winter photography by Heather. Bookmark the permalink. It may not be spring, but it sure is lovely! Hi bebs (that’s what I call my daughter sometimes). Sounds like you had a great weekend! I’m feeling that there’s something in the air that Resembles spring. OK, it’s not spring, but it’s a precursor. Maybe because the icicles are dripping sometimes. I love one of your pics but sometimes wish that you labeled them so I could tell you which one easily. OK, it’s a challenge. How to visually describe the picture. OK, let’s forget that, too and describe it as the picture which immediately precedes the words “After basking”. I love that one especially! Greetings Ms. Kathy 🙂 We DID have a great weekend, and are working to bring that attitude to the start of this week. I’m not pining too hard for spring, but there is definitely SOMETHING out there that’s decidedly spring-ish. I agree that it could quite well be the drippy icicles, but I also think the sun feels warmer. We were skiing this afternoon, and actually felt WARM on the lift. Yes, it was still freezing, but the direct sun felt so warm. It’s spring somewhere–that’s a good attitude! But you do seem to be making the most out of winter!